Yesterday I went to the supermarket opposite my house, Sainsbury’s, and was really happy to find that they are now selling tofu. One of my favourite things to cook with but one of the more inconvenient things is Tofu, inconvenient as it means I have to go to the Chinese supermarket. Tofu is one of the greatest things to come out of Chinese cuisine. It’s incredibly health and has high protein, vitamins, calcium and minerals but it’s also low in calories, sodium and fat. Research has also shown that tofu is great for combating heart disease and is good for ladies when they’re going through their menopause. So, with all those great benefits, why can’t we buy tofu in every supermarket in the UK? I think it’s because people don’t know how to cook tofu or they had bad experiences with a tofu dish that has been cooked incorrectly. For example, my husband was talking to his colleagues and they said when they tried to cook tofu it turned into a sloppy mess. Cooked properly it should keep it’s shape and texture. Tofu is a very common ingredient in Chinese and Taiwanese cooking. We cook Tofu in many different cooking ways including stir-fry, pan fry, steam, stew, deep fry and more. So, here is my recipe for my tofu dish today. It’s called “steamed tofu with prawn”. The preparation time for this dish is around 20 minutes. It’s quick to make, simple, healthy and cooked without any oil at all. How great is that?! Next time people who try to call Chinese food unhealthy might start thinking again. People in western society often think Chinese food is about sweet and sour, prawn toasts, msg, fat etc but in actual fact good Chinese food is nothing like this. Take out the tofu from package and dry it. Sprinkle a couple pinches of salt on the tofu and leave for a couple minutes. Cut the tofu into 1 cm thick pieces. Use a cookie cutter to cut the tofu and use a teaspoon to dig a small hole in central of tofu. Use a food processor to process the prawn with all the seasonings. Roll the prawn mixture from step 3 into a small ball and put in the central of tofu. Steam the tofu with full power for 10 minutes. Mix all the seasonings for sauce in a small saucepan and bring it to boil. You must stir it occasionally while it cook. Pour appropriate among of sauce on top of tofu and ready to serve. Edinburgh has been snowing for five days now. 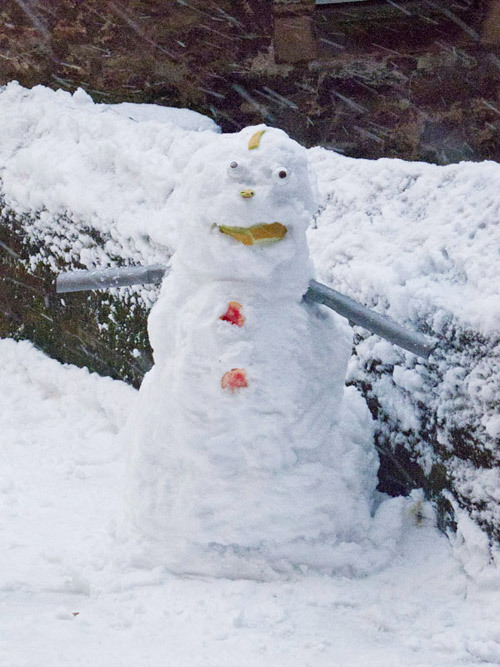 The snow has affected most public transport and people are really struggling to drive into Edinburgh from outside. I feel really thankful that I live fairly close to work as the roads between my workplace and home haven’t been affected too much, but some of my poor colleagues have had to walk a couple hours or more to get home. I feel terribly sorry for them. Even though the snow has caused a lot of inconvenience in my life I’m still really excited about snow. In Taiwan, snow only happens on the top of mountains and not that often. But funnily, my colleagues like to remind me not to touch yellow snow as they know as soon as I see snow I’ll go out and play in it. As a note the temperature in Edinburgh as I’m writing this blog post is -6C but I talked to my parents earlier today and it was 24C. I’m jealous! Another exciting thing has come along with the snow. Just today I received an invitation from Ricefield Arts and Cultural Centre in Glasgow to do a few speeches as part of the Chinese New Year Festival in Glasgow. I’m really excited but also nervous about this.The event runs for a month from February 2011 but I must start thinking about topics for my speech. Please leave me a comment if you want to know any food related things about Chinese New Year or if you have any questions about what we eat and why we eat it. This could really help me with the talks.In my last post I talked about day light issues so I’ve decided to start making some stir-fry and soup type dishes. Today I have prepared and cooked stir-fry lamb with Chinese bbq sauce. This tasty, healthy and simple stir-fry dish can be prepared and cooked in around 15 minutes. I used “water spinach” as the vegetable with this dish but you can also use cabbage, brocolli or any other kind of green vegetables to replace water spinch if it’s difficult for you to go to a Chinese supermarket. The amount of chilli you need in this recipe is entirely a personal choice. If you want it spicy add a lot but if you like your dishes less spicy adjust accordingly. A lot of the dishes Chris and I eat at home have chilli in them both because of flavour but also because they help to warm us up. 1. Marinade lamb with soy sauce, sugar and potato starch. 2. Wash the water spinach and drain away the water. Cut it into 3 cm long slices. 3. Heat a wok with 1 tablespoon of oil and stir fry the lamb first and add the garlic and chilli. Stir fry it for 30 seconds and add the BBQ sauce. Stir-fry it for a couple minutes. 4. Add water spinach and use salt to season the whole dish. Stir-fry it until the water spinach is cooked. Stir in some potato starch water (just ¼ teaspoon potato starch or corn flour mix with 2 tablespoon water) and cook for another 30 second and it’s ready to serve. Recently I’ve been seriously struggling with daylight. I planned to cook three dishes this week but with the sun now starting to go down around 2:30pm I can’t do a lot of photography after I have finished cooking. This is really annoying me! It’s very hard to take nice food photos without natural or studio lighting and I’m definitely not an early bird person on my days off. As a note I work from 9am typically until 12am-1am, once customers have ordered their final desserts. I’m not a wealthy person who can spend a couple thousand pounds on studio lighting and I’m not a housewife so time is limited. So, rant over. Now I’m thinking about new ideas for my blog. Sometimes life’s difficulties are a good thing and it’s made me think about preparing quicker dishes to cook. Some of the most simple dishes are the tastiest. I had a chat with one of my colleages the other day at work. She told me she really likes my blog but a lot of the dishes have too many ingredients and involve too much preparation. This conversation made me think a lot. I really value everyone’s opinion of food and what they like to learn or see from my blog, it gives me new ideas and a new point of view to my cooking. Here is my latest recipe. This ideas of this roast crackling pork is from one of my favourite Chinese restaurants in the UK called “Imperial Palace”. Everytime I go there I want to eat this dish and it makes me keep coming back. So, I decided to give it a go. In the end it’s turned out not too bad. Wash the pork belly and cook in boiling water with spring onion and ginger. Cook pork belly for 5 minutes and prod a skewer inside pork. If no blood comes out it’s cooked. Soak in cold water immediately and dry it with a clean tea towel or napkin. Use a dry frying pan to sauté the Sichuan pepper until the aroma comes out. Then use a pestle and mortar to grind the Sichuan peppers into a powder. Prod the skin part with a skewer or the tool that I have pictured in this post. I bought this tool from local Chinese supermarket for about £5. Brush the soy sauce on every side of pork belly. Mix all the seasonings together evenly and gently rub the seasonings on pork belly. Leave the pork belly marinade for 2 hours. Tin foil wrap the side and bottom of the pork belly. Only leave the skin part unwrap. Put the pork belly on the middle oven shelf. Pre-heat the oven to 230 degrees and roast for 20~30 minutes. Take out the pork and brush a thin layer of oil. Roast in oven (temperature 180 degree C) for another 20 minutes. Crystal dumplings are a unique kind of dumpling that takes the name crystal as it looks a bit like a crystal on the outside with it’s almost translucent skin. Obviously this dish doesn’t contain a crystal. 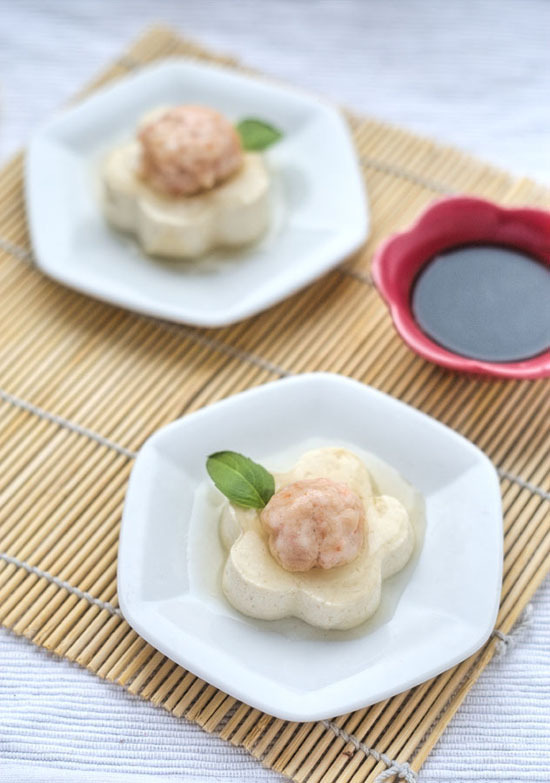 Sometimes Taiwanese families will cook crystal dumplings around Chinese New Year because both the look and name of this dish sounds pleasant. You will find often in Chinese, Cantonese and Taiwanese cuisine people love to serve food with a name like dragon, phoenix, pearl, gold, diamond, crystal or something else. I tried using a couple different recipes for the pastry in this dish but in the end I found the easiest but best recipe is simply to use potato starch and sweet potato starch. If it’s too difficult for you to find sweet potato starch then just potato starch on it’s own is fine. For the filling I used beef mince instead of pork mince for a change. An awfully large number of Chinese and Taiwanese dishes use pork or chicken as their main meat ingredients but I don’t always want to use this ingredients. My work partner told me “change is the spice of life” last week and that has stuck with me. I really dislike falling into a certain cooking pattern so for this and my new few blog posts I’ll be using completely different ingredients. Another thing I’m thinking about doing is expanding my website to include some western dishes that I have learnt over the years. Through college, eating out in different cities, friends and working as a chef I have learnt a lot of really tasty Western recipes. So here is the recipe for today. It’s not pork or chicken and also it hasn’t been deep-fried. I hope you will enjoy it and remember give me some feedback. Heat a wok with 2 tablespoons oil. Stir fry the onion and ginger until onion gets a little bit golden and brown colour. 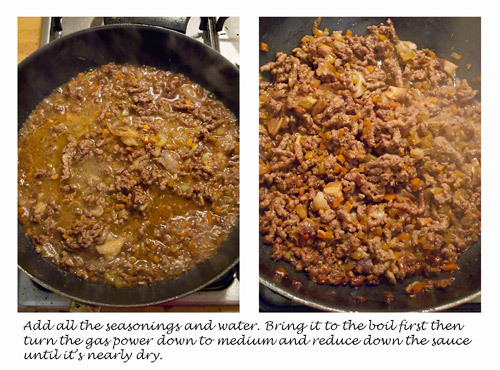 Add mince and keep stir-fry it until outside of mince cooked. Add celery and carrot and keep stir-fry it for another 5 minutes. Add all the seasonings and water. Bring it to the boil first then turn the gas power down to medium and reduce down the sauce until it’s nearly dry. Add salt, sweet potato powder and potato starch into a big bowl and pour the hot water a little bit once. Add some oil to knead the mixture until it’s not sticky anymore. Cover a wet clothes on top of the mixture and leave it for 10 minutes to relax the mixture. 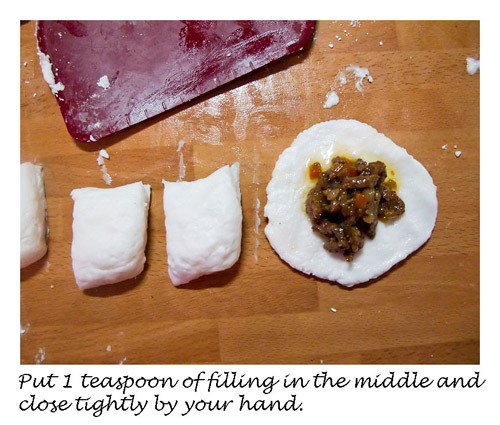 Separate the pastry mixture to appropriate size of small balls and flatten it by your hand. Put 1 teaspoon of filling in the middle and close tightly by your hand. Use your fingertips to change the shape from a ball to a triangle shape. Boil a pot of water and cook the crystal dumplings in it. They are cooked when the dumplings float on top of the water. Mix everything evenly in a small pot. Bring the mixture to boil and turn to low heat to cook it until the mixture turns fairly sticky. ** You can use soy sauce as dipping for crystal dumplings or you can also try to make this Taiwanese sweet chilli sauce at home. Wontons are a very popular dish in China, Taiwan and Hong Kong. Even different provinces in China have different names and different cooking styles for this popular dish. There are many different stories about Wontons. My favourite story is about how Xi Shi created this dish. Xi Shi is one of the four most beautiful women in Chinese history. She originally comes from Kingdom of Yue during period of time called Spring And Autumn. During a war with King Fuchai of Wu, King Goujian of Yue was imprisoned after he was defeated. After his imprisonment, King Goujian of Yue secretly planned his revenge. He trained beautiful women and offered them to Fuchai as a gift and Xi Shi was one of those beautiful women. Xi Shi thought King Fuchai was a completely ignorant, chaotic, stupid pig. In Chinese language, there is a word which sounds very similar to wonton which translates to chaotic, so she decided to call this dish Wonton. So, this is basically how Wonton was created. Even though the name for this dish isn’t that affectionate it doesn’t affect the taste. I deep-fried the wonton today instead of serving it in more traditional wonton soup as I really like the crunchiness of the batter. I have to say I really love wontons whether they are in soup or deep-fried but my personal preference is for deep-fried. Process half of the prawn, pork, spring onion, ginger and all the seasonings in a food processor. Roughly chop the other half of the prawn and mix evenly with step 1 (this ensures the filling texture tastes better). Put 1 teaspoon of filling in the centre of the pastry and use your fingers to gently close the pastry tightly as shown in the procedure photos. Heat a wok with some oil at full gas power. Put the wontons into the wok and turn off the gas and let the wonton fry until the wonton turns a nice golden colour. ** Oil temperature is about 180 degree. Turn off the gas after placing the wonton inside so it cooks through. This will ensure the outside doesn’t burn but the inside isn’t raw. 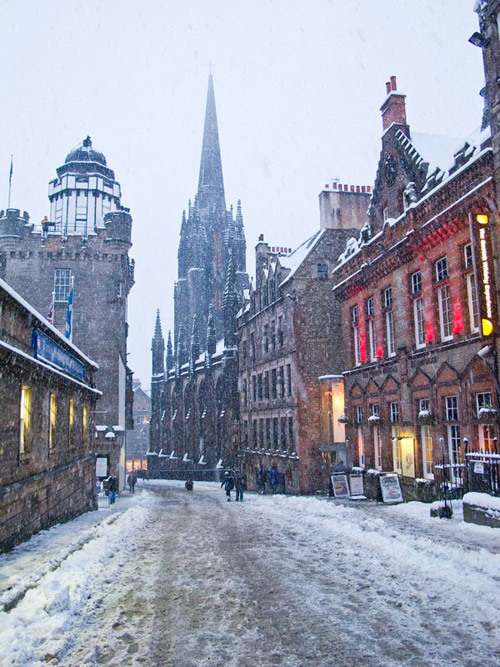 In Edinburgh the season has changed once again and it’s turned really cold now. I feel like I’m still recovering from our holiday where we had really hot weather but recently I’ve had a really nasty flu and so the weather in Edinburgh hasn’t helped. The best kind of food for this kind of cold wet weather is a bowl of hot and tasty noodle soup. So, today I’m sharing with you a famous Taiwanese noodle soup called Tan Tsai Noodles. The story of Tan Tsai noodle began in 1895. There was a fishmonger, Mr Hong, whose family migrated to Fucheng from Zhangzhou in China where he learnt how to cook noodles while making a living catching fish. After some time he moved to Tainan in Taiwan where he still made a living catching fish. In Taiwan there are two festivals, one called the Tomb-Sweeping Fesetival which is held in March and the other called the Moon Festival which is held in August. Between these seasons is a period called the “Slack Season” where fisherman can’t go out on the water, so Mr Hong began selling noodles. His noodles had a unique taste and so became really popular so he then decided to sell noodles full time. During the beginning he would carry his noodles on shoulder poles so he could sell them in the streets, so he called these noodles “Slack season Tan Tsai Noodles”. These are known as “Tu Hsian Yueh Tan Tsai Noodles”. “Tu Hsian Yueh” means slack season in Chinese and “Tan Tsai” translates to shoulder poles in Taiwanese. So, as you can imagine this noodle soup perfectly sums up my situation right now. Since coming back from holiday I’ve been experiencing a slight “financial slack season” and all of the ingredients for this recipe are easy and cheap to get hold of. But the most important thing about this dish is the price doesn’t reflect on the taste, it’s still incredibly tasty. It proves that both expensive and cheap food can be equally tasty. Personally, I like local market food rather than fancy restaurant. It tastes a lot more home made but good home made food is always better than restaurant food. By the way, I finally took a final picture myself. Now it’s getting dark and with Chris’s work schedule he really doesn’t have time to take photos himself so he taught me how to do the photos. Hope you like it. Put everything into a stock pot and cover the ingredients with water. Heat a wok with 2 tablespoons oil and stir-fry the pork until it’s cooked on the outside. Add all the ingredients and mix them evenly. Boil it first then simmer around 30 minutes to reduce down half of the sauce. Poach the prawn and vegetable in a pot of boiling water first. After cook the noodle in the boiling water. Place noodle and some mash garlic (optional) into a bowl and pour some mince sauce on top. Garnish with prawn and vegetable and add the soup.